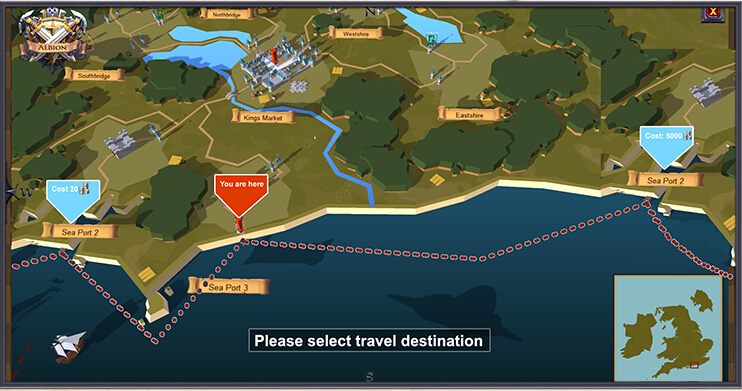 Albion Fast travel is another recent addition to the game based on tester feedback. Though implemented as a way of reducing frustration from long-distance travel across the world, fast travelling in Albion Online Gold won’t be an “easy” way of getting around the world, and will initially be limited to safe cities and hubs. Currently fast travel is possible only over water, and thus will be allowed between two cities which have harbors. Fast travel will also cost a fair amount of money, as the captains won’t insure your goods for nothing on the journey. The cost of fast travel will go up significantly as your load weight increases, so it won’t always be a feasible alternative to travelling on foot or horseback! Previously when players died anywhere in the world, they would respawn at the starting hub city, King’s Market, which could frequently mean very long and very dangerous walks through several regions of Albion if the player’s corpse was far away from the city. The frustration caused by these hazardous journeys inspired a new system whereby players can choose a number of locations at which to respawn, giving them the option to make those corpse runs a little easier. • Player house declared as a residence. Residency is a new concept to Albion Online. As part of the new housing and real estate system, players will now be able to declare certain residences for themselves. These residences will be specially selected player-owned plots. Players can choose a location and officially declare residency there, which will then add that residency to the respawn location list. Players will be able to revoke and switch their residencies as they decide to, customizing their respawn location list tactically depending on their location and circumstances.